beautiful to see these massive guys. Great photo Pat. I haven't been out there lately. The colors have definitely changed. Stunning. Looks like a diorama in the Museum of Natural History. This is a beautiful photo of htese magnificent animals! What nice racks, I like thefog. Love that the one guy has a mouthful of grass. Hi there - I always think its a real thrill to meet an aniaml that is bigger than you are. Adds a big of perspective to the day! A superb capture of these wonderful beasts. Watching the slideshow on your main page is like seeing a NG or a BBC wildlife documentary. What a feast for the eye! And this photo is also gorgeous. 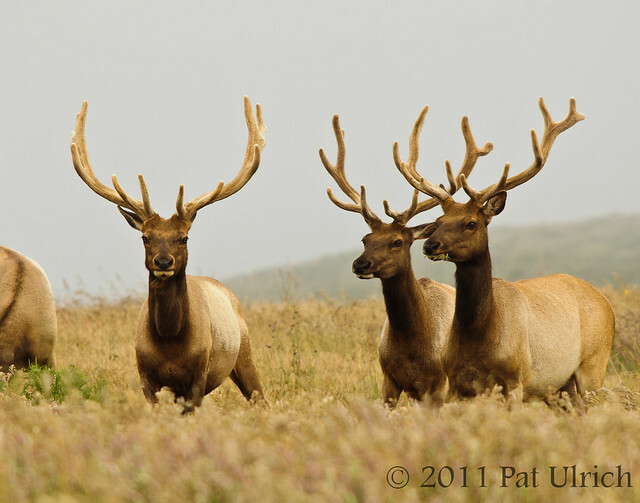 Incredible crisp capture of these majestic looking males! Those antlers are really something. Great angle. Always a pleasure to view your superb images! Just magnificent -- wonderful photos. Thanks, texwisgirl! It is always fun to have an encounter with such a powerful animal. Thanks, Jim! Yeah, it has full on changed from green & flower dappled to shades of brown. Although the grasses are blooming beautifully right now, which is actually why I decided to take this hike that day. Thanks, Sinbad & I! I hadn't thought of that, but it kind of does! Thanks, Carol! This was about as light as the fog was. It was literally changing by the second -- with some moments like this, and then some like peasoup just a shore while later. Thanks, Jarred! Fog is an essential part of Point Reyes Natioanl Seashore -- the lighthouse area is called the "foggiest place in north america" (although I don't know if the data back that up or not). Thanks, Carletta! The herd was enjoying an evening meal. Thanks, Stewart -- I totally agree! Thanks for your really kind words, JM, I'm glad you enjoyed the slideshow! Thanks, Julie! The antlers are still covered in velvet, but it won't be too long before they rub it off and begin the rut.